We all have a salty friend; the one who always seasons their food a little too much, or thinks someone’s sprinkling that popular mineral in their direction when that’s not necessarily true. What can you do to help these friends that have a hard time keeping their cool, the ones that dare to pour an entire bottle on their dish, who can’t keep their seasoning away from their plates? It’s simple … give them some water! Water is the perfect way to wash their mouths and keep them refreshed. Did you know most people who are extra salty don’t realize how salty they’re being? In fact, the reason they add more salt to their diet is because they’ve grown so used to salt, they think they’re missing out when, in reality, they’ve gone salt crazy! It’s our duty, as proud Neopians, to help out our brethren and get that salt out of the way. Here’s a list of the best, tastiest, and fanciest waters you can get for your salty friend! This inexpensive mug of water—filled to the brim with apples!—is an excellent choice to help out even your saltiest of friends; the water is a bit strange, but once they get used to the strange taste they won’t be able to resist another cup … or three! Not only will the room-temperature water keep their throats clear of residual salt, but the apples bobbing up against their mouths will keep them from ingesting more than their daily dose of that mineral. While technically for Petpets, this water bowl is PERFECT for your salt-loving friend. Since there’s no handle, their hands will be too occupied holding the bowl up to their mouths to grab for any extra salt. If no one’s there to make sure they aren’t stirring up too much salt in their dishes, it’s better to just distract them, right? This water bowl will do just that! Plus it’s in the shape of an adorable Mortog; who wouldn’t love it? Not only will this wash the salt out of their mouth, this amazing item will also restore their health—if they were damaged by any of this excess seasoning, it’s no problem with this magic water; refreshing and healing … who knew water could be so awesome? Phew, this water is for your spiciest friend—the one who not only adds a lot of salt to their meals, but spice as well! It’s been ultra-iced for ultimate satisfaction; the water and glass have been frozen to ensure the water is at peak drinkability. Your friend will have a sport taking long sips from this fancy drink! Have multiple friends that can’t seem to keep their fingers out of the salt jar? This water pot was designed just for you—it has TWO SPOUTS! Now you can refill your friends’ drinks before they even finish them and attempt to get some more of that salty goodness. While any officially Altador Cup team water bottle will work, the Year 8 Maraqua Team Water Bottle has proven to be the most effective for a few reasons: the first being most people prefer Team Maraqua (and once they run out of water to drink, they’ll start gabbing about their favorite team) AND the water seems to be more concentrated, for peak sodium-flushing! With all this talk about Maraqua, who has time to eat salt? Okay, so this water isn’t necessarily the freshest, or healthiest, or even regulated for consumption outside of Lutari Island, but this one is to make a point. And that point, dear reader, is to let your friends know that ingesting massive amounts of salt—no matter what they’re eating—is BAD FOR THEM! By forcing them to guzzle this entire container of Sparkling Bog Water will teach them a valuable lesson: don’t be a princess and you won’t have to face the consequences of learning lessons! They probably won’t be very happy with you, but life isn’t always a constantly-filled salt shaker. Sometimes it’s a big jar of icky water. Does your friend enjoy the finer things in life? Perhaps they’ll enjoy all the finest water, purified through painstaking filtration techniques. If you’re willing to hand over the few thousand Neopoints it costs to get your hands on this bottle, your friend will be in too much shock being dazzled by this water to even think about their additional salt intake. While they’re going gaga over the water, saying “ooh” and “ahh” and showing everyone, you can take those salt shakers and toss them out the window. No one will know. Willing to splurge a lot to keep your friend hydrated and safe from the plague that is too much salt? This expensive flask will do wonders for the friend you’re trying to help! 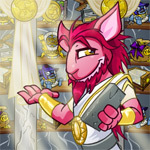 They’ll find not only the taste refreshing, but the magic surge through their bodies; see, this water changes your Neopet’s color, so it only makes sense that your friend’s hair would change—it’ll happen as quick as lightning, changing them into any color of the rainbow! It doesn’t seem fair, but maybe a change in their luscious locks will teach them they don’t always get the benefits of a salty diet when it’s not right for them. Hopefully, this list was a gentle nudge to address your salty friends’ bad behaviors and dangerous diets. Having a nice sprinkling of salt on top of your fish and chips isn’t so bad, but recently too many of us have noticed our beloved friends taking in much more salt than the doctor would allow … we need to keep our friends healthy! We need to keep ourselves safe from the side effects of too much salt! In fact, when you present your friend with any one of these waters—or even just plain, boring water from your home—they’ll drop to their knees, thank you profusely for bringing them back to their senses, toss all their salt out the window, and start thinking rationally again. Remember; some salt is good, but too much is, just, well … not very cool.